Snow Load Requirements: lower slopes create more load that the roof/structure must support. For example, when you have a flat roof and it snows, the snow will stay on the roof, adding more weight; on a sloped roof, a good amount of the snow will slide off of the roof, so the load will remain in an acceptable range the structure can support. Wind Load: Preventing roof damage from high winds is largely dependent on roof geometry, slope and building material used. If outside air is allowed to penetrate a structure through cracks and other openings when wind flows over a building, the air pressure beneath the roof assembly increases. When this pressure becomes greater than the pressure directly above the roof (which happens as wind flows over a building), this can cause upward force on the roof system, leading to loss of structural integrity and significant damage. Wind uplift rating and minimum slope requirements are dictated by building codes in the market, so be sure to check with your local municipality for specific details. Water Diversion: the steeper the pitch the faster it will channel and divert water, preventing it from pooling and causing other issue like mold, mildew and paint degradation. As with the snow load considerations mentioned above, the less additional weight burdening the roofing system, the better. Minimizing Debris: steeper-sloped roofs also help minimize the chance that debris, mold and mildew have to build up on the roofing system. Unless there is a catastrophic weather event that drops large amounts of heavy debris—tree branches for example—there is a small chance that debris on a roof of any slope will exceed its ability to carry the load. However, because the more debris is able to slide down and off of a metal roof, the less that needs to be manually cleaned. Additionally, access to and cleaning the eaves of sloped roofs is much easier and less time-consuming that trying to perform the same maintenance on a roof with less slope. Tensile strength: This refers to the panel’s ability to resist breaking when it’s placed under pressure or tension—meaning the panel has a measured ability to bend under a certain amount of stress before it snaps. 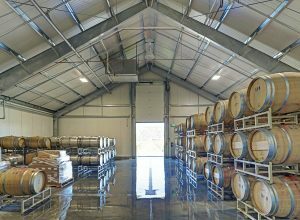 Galvanized steel panels can withstand between 50,000 and 80,000 pounds of pressure per square inch (50 KSI – 80 KSI)—significantly higher than the tensile strength of other roofing materials. Despite this, metal panels remain lighter and more impact resistant, keeping the likelihood and cost of repairs to a minimum. Check the tensile strength of your metal panels with the manufacturer and be sure to reference common testing standards related to roof slope, including ISO ratings and ASTM standards that test tensile strength. 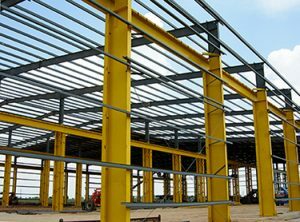 Steel Hardness and Density: While it can generally be assumed that thicker-gauge panels are stronger, the type of building construction, location and end-use can affect the choice in panel thickness. Buildings such as pole barns, post-frame buildings, warehouses and garages can require roof panels to span longer distances and therefore require thicker panels as they are more structurally sound. These thicker panels will also aid in reducing the chance of collapse under the weight of snow and water—particularly when the roof pitch is low. For smaller buildings—like residences—with supporting trusses and purlins that are typically closer together, thinner panels can be used in conjunction with thicker trim for an economic, structurally ideal residential metal roofing system. See our blog on metal panel gauges for more. Following common standards, doing adequate research and conforming to manufacturer guidelines regarding slope will ensure you’re reaping the full benefit of your metal roof panel selection. For more information on metal roofs and to learn more about recommendations on roof slope, contact your local ABC representative today.